Highfields Pioneer Village has traditionally hosted many thousands of people from near and far, celebrating Australia Day in a unique heritage location. 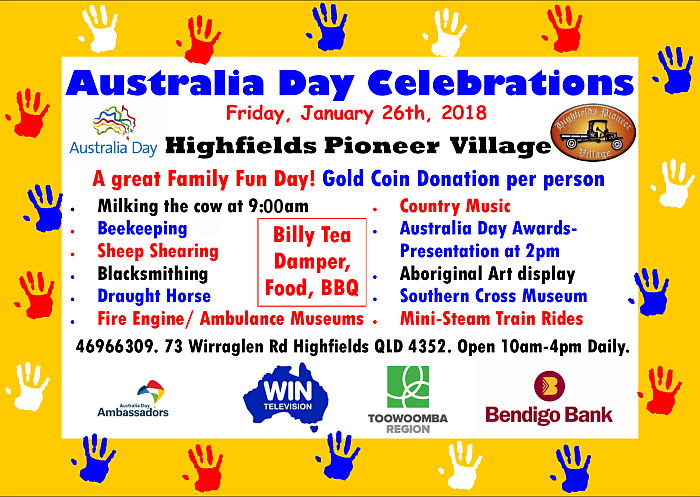 Australia Day Celebrations at Highfields are jam-packed full of fun with displays and entertainment to interest all ages. The day kicks off at 9.00am with Milking of the Cow, then Beekeeping, Blacksmithing, Working Draught Horse and Whip Cracking School. There will be plenty of good Aussie tucker, meat pies, vegemite sandwiches and Billy Tea and Damper. Guest Artists Trevor Dodds, Brendon Walmsley and the Cactoblastis will perform. There will be an Aboriginal Art display, Family Games and children will love the Baby Animals in the Nursery. The official presentation of Australia Day Awards will commence at 2.00pm, followed by free afternoon tea sponsored by Toowoomba Regional Council. We finish the day around 5.00pm. Entry is by gold coin donation per person to support the heritage village and will be gratefully accepted and appreciated. Highfields Pioneer Village, Museum and Park Inc. is a non-profit organisation run entirely by volunteers, and is dedicated to preserving the history of the Darling Downs for future generations. Normally open 10am to 4pm daily at 73 Wirraglen Rd, Highfields.